Sometimes there are stories which have to be told. 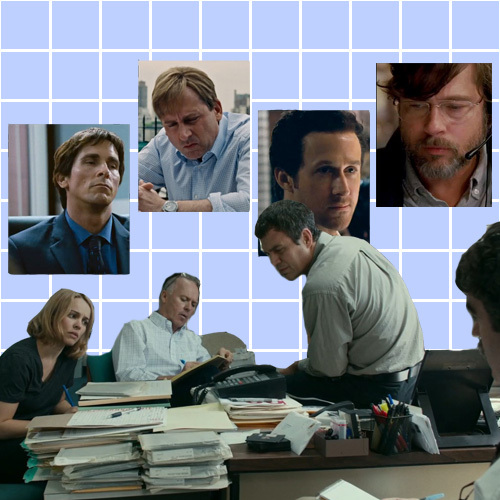 ‘Spotlight’ and ‘The Big Short’, two of the most acclaimed and lauded films of 2015 (and my two favourites of the awards season crop), are such stories. In some respects, the films are very different. ‘Spotlight’ is highly understated and distinctly un-flashy (it’s costume designer Wendy Chuck suggested her goal was to make the least fashionable film ever). ‘The Big Short’ is bloated (some may say to its detriment), stylistic, and post-modern, with the presence of writer and director Adam McKay firmly felt. Both though, share in the fact that they challenge established systems of authority, and the accessibility and openness of these systems, through their stories and messages. Neither film lets anything overshadow the story at the the centre. For ‘Spotlight’ this story concerns the widespread, institutionalised sexual abuse within the Catholic Church in the city of Boston, first uncovered by the Spotlight team at the Boston Globe in 2001. Told through the perspective of these reporters, the sordid buried secrets unfold in front of the audience’s eyes just as it does for Spotlight. I never stopped thinking about how all of it was true, how it really happened, how it was really uncovered and how I knew nothing about it. There’s a sadness in how the story of ‘Spotlight’, a story about a story, still has the power to shake an audience. Most people know about sexual abuse within the Catholic Church (and the shocking end credits of the film remind us how widespread this truly is), but in daily conversation it is too frequently made into filthy jokes about dirty priests where systematic sexual abuse becomes a punchline. The blasé attitude in which abuse is discussed creates an environment where the Church isn’t under pressure to confront the insipid problem that lies at its heart, and therefore can sweep things under the carpet. Possibly in response to this, ‘Spotlight’ goes to great lengths to remind us of the power the Church has, and to link it explicitly to corruption, such as how they were able to prevent access to damning public documents. It’s telling that victims who are represented in the film have said that only now do they feel like people are beginning to stick up for them. It operates as a wealth of information accessible to the general, movie-going population, about the abuse that pervades throughout the Catholic Church, how (highlighting sexuality, class and power complexes) this abuse occurred, and how it was hidden. Writer and director Tom McCarthy has commented on how his film aims to attack the societal complicity of creating environments where the authority of institutions isn’t challenged. ‘Spotlight’ breaks down this societal complicity; through challenging authority it captures the painful reality of the situation and places it firmly in international conversation. ‘Spotlight’ is a film that celebrates investigative journalism and the relentless pursuit of truth and information it involves, clearly placing value in the accessibility of current affairs and a society where truth isn’t kept at the top. This value is one that ‘The Big Short’ shares, though while ‘Spotlight’ is a film that celebrates and promotes accessibility, ‘The Big Short’ wants to create it. There’s a sense that McKay sees himself as a film-maker on a mission to expose the rank underbelly of the world economy, a man out to challenge the presumed authority of bankers and economists through film itself. The film, detailing the events which led to the financial crisis of 2007-2008 and the few people who saw it coming, doesn’t shy away from complicated economics order to make itself more accessible to its audience. Instead it recognises that these concepts are deliberately coded in impenetrable language to divert public attention and scrutiny, and increase the trust people have in the banks – because, hey, they understand what a synthetic CDO is, and we sure as hell don’t! The decision McKay makes to have celebrities such as Margot Robbie, Selena Gomez and Anthony Bourdain to explain economics thought inaccessible is a radical one, constituting and encouraging a challenge to banks, stock brokers and rating agencies who position themselves as noble authorities. Information that was thought to be privy to only a few ‘in the know’ is suddenly presented like it’s an element of pop culture, something that should be as accessible as the tabloid exploits of the celebrities who voice it. This film taught me more about economics in 2 hours 10 minutes than I thought was possible. Like ‘Spotlight’, it takes a narrative the audience has experienced and makes it shocking – this time, nothing’s deliberately hard to grasp, and everything makes you despair. ‘The Big Short’ is an upsettingly relentless cycle of corrupt authority and horribly necessary information. It’s a film about truth – the truth the central characters discover that the world attempts to deny, the importance of truth and transparency, the moralistic tale of not creating a version of truth out of smoke and mirrors, and the attempt to bring truth to an audience it was diverted from. It’s hard to say I loved these films. It feels borderline inappropriate given how angry they both made me. I cried at ‘Spotlight’. I nearly cried at ‘The Big Short’, mostly because I’m a ridiculously emotional mess but also because, and not to be cringey or melodramatic, the world is so fucked. That aside though, I did love these films because what they achieve is so impressive, they probe and accuse and ask questions and give answers. They’re truly challenging films about complicated, difficult things and they are stories that ask their audiences to think about who they listen to.